So I was surfing through eBay... in the merry merry month of May... and came across some pulleys. Pfft! "Load a crap," I thought. But then I got to thinkin'. Always, ALWAYS, a bad omen. Pulleys: less accessory load = more available power, everybody else has them (Oh this is gonna be bad), and, but wait, only $25.00? A bit more surfing and much to my surprise the pulleys looked to be almost exactly like the MUCH more expensive GReddy pulleys I had seen on many cars in the years prior. The price of the GReddy pulleys being the reason I had not bought a set earlier based on the cost to benefit, basically a lot of moola for little gain. And then there are these eBay "specials" for $25. What did I have to loose? So I bought a set. Mind you it was the pulleys only - no belt. The pulleys arrive and sure enough they are essentially identical to the GReddy pulleys seen elsewhere. From an engineering perspective a pulley is a piece of cake to manufacture. With dimensions it's merely a case of turning the piece on a machine lathe. Installation did not go without issues. The principle issue being I couldn't find a 5 rib belt to fit. I used a Dayco 5 rib belt pt#5050540 ($16.99). The 565 was too long but being the next longest size. Ideally A 550 or 555 would have been ideal (this number being the belt length in mm) Without a 550mm belt this meant further work on my custom made airpump bracket (See pic below in radiator hose section). But in the end I was able to shave the bracket and use an off the shelf belt that fit and all is well in the world again. 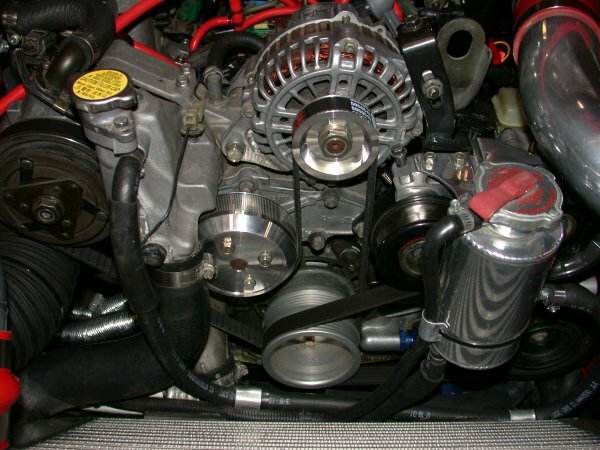 OEM configurations using a normally mounted airpump or running no airpump will probably need a different sized belt. There were no issues with the pulleys themselves. They mounted perfectly. eBay (faux GReddy) underdrive water pump and alternator pulleys. As for the benefit it's hard to say. They are certainly lighter than the pretty heavy OEM steel pulleys and the alternator pulley was large enough to cause me concern. Concern regarding underdriving the alternator so much, given I already had an underdrive main eccentric shaft pulley, that the system would not support the electrical loads of the car. So what do you do? Start the car, let it reach a normal 780rpm idle and turn on every electrical load you can find and check the voltage. High beam headlights, (aftermarket) fog/driving lights, heater fan on high, interior lights (doors open) on, rear defroster on, radio cranked up as high as your ears will allow, hazard lights on, and foot on the brakes, windshield wipers running, and any other accessory you have tapped into the system (like a boost controller) turned on. The result, with this pretty large load, 11.8volts (read from the PFC). Err...not so good. Note to self: Don't turn on every electrical load when the car is idling! The biggest load was the rear defroster. Turn off the defroster and the volts jumped to about 12.8volts. Still low. Take your foot off the brakes and turn off the turn signals and we are back into 13v range. Better. Since brake applications are short, normal electrical loads should not reduce electrical "capacity" to the point where the car runs off battery juice vs alternator juice. However, these pulleys do seriously affect the ability of the electrical system to supply the demands of the car. And if you have a heavy duty stereo system I'd caution using an underdrive alternator pulley with an underdrive e-shaft pulley. Does this reduced charging affect the ignition system too? I found that it does not. Testing on the track I had no ignition breakup at WOT loads to redline. Mind you I had no other electrical loads present either. As for underdriving the cooling system (bigger water pump pulley), I've never had issues at idle (with the vented hood the fans work just fine) and on the track. 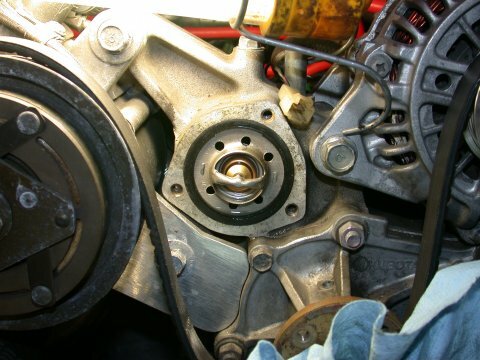 Underdriving the water pump pulley may reduce the propensity to cavitate the pump at high RPMS thereby actually helping with cooling at high RPMS. And some have even said slowing down the coolant flow helps cooling by allowing the coolant to stay in the radiator longer prviding more time for the coolant to reject it's heat load. This works both ways though in as much as it allows the coolant more time to heat up, and possibly boil (not a good thing), when inside the motor block itself. In the end I drove the car on the track and had no cooling issues and temps remained pretty much where they were before the new pulleys. The only hope is that I was able to use a few more of the Hp to make the car go faster. $42.00 money well spent IMO...well at least it's more shiney aluminum under the hood. 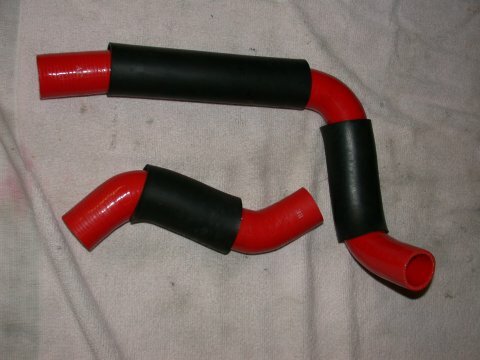 Twas a "bad" day to be surfing eBay as I also found a set of *RED* silicone radiator hoses. As vain as I am I had been looking for red hoses for some time. Unfortunatley the only silicone hoses I was able to locate were made by Samco and came only in Blue....and were expensive. 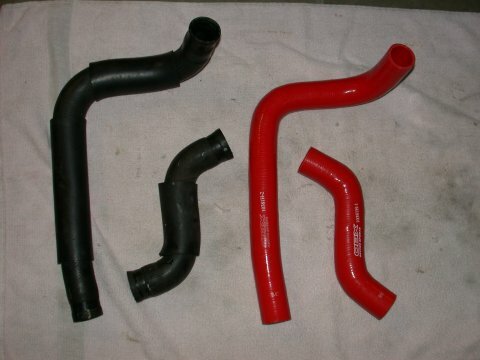 So much to my delight I found this model specific OBX radiator hose kit for the 93-97 Mazda RX7, new and in *RED*. And they were not that expensive at around $42.00. Cool! There has been much debate about OBX products on the turbo end of things as OBX makes single turbo manifolds of questionable quality, some having had good luck with them some have not, but still all heresay to me. Still at $42 for the radiator hoses I bought them anyway. Turns out they are triple reinforced hoses and look more than capable of doing the job and as my old OEM hoses needed replacing I decided it was time. [left] The old and the new. [right] "sleeved" new hoses. Installation is as straightforward as any other routine maintenance job and I was able to change the hoses with little disassembly of other engine components. Since the coolant system was drained I swapped out my summer "track" drilled thermostat (pictured below) for my winter OEM street thermostat. With the drilled thermostat in place the car will NOT reach operating temperatures during street driving in thw winter...which makes for a VERY cold drive to work when I venture out once in a while to exercise the car in the colder weather. Tells me the drilled thermostat works very well indeed....almost too well. 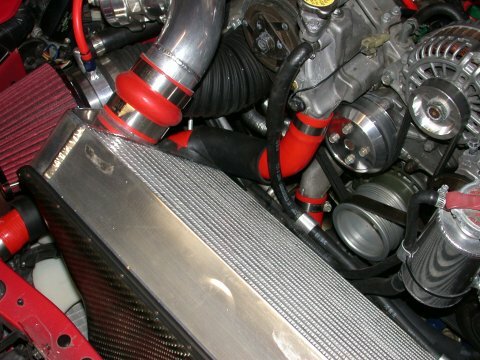 Also pictured below is the custom made airpump bracket discussed above and during the single turbo installation. 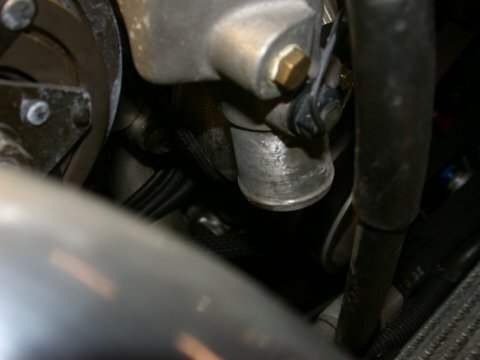 The only caution about changing radiator hoses is to make sure the mating surfaces are clean. Sounds like common sense, eh? But it is Oh SO tempting to get lazy and just slap the new hoses on. 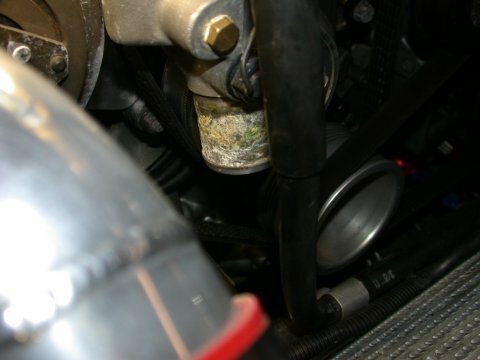 However corrosion buildup is a recipe for cooling leaks. I used a stiff wire brush and emery cloth strip (used like a shoe shine) to clean the water pump outlet and lower block inlet.It's always a worry that new hose connections will leak so fingers crossed. And since silicone is much more prone to abrasion than rubber I swapped out the older sleeves to protect the hoses from rubbing on nearby components. And then there is the refilling/burping of the cooling system that is a real pain in the neck. The good with the bad, but the new hoses now match the rest of the silicone couplers in the engine bay and I think look pretty good. We shall see how well they stand the test of time. Clean that nastiness off those hose connections! Before and after pics using a wire brush and emery cloth.